I found a link on my Facebook feed today and was blown away by it. Don't you just love that feeling when all you want to do is drop everything and TRY something new? That's how I'm feeling after browsing through this collection of stills. It's always a challenge to get skin tones right when grading your footage, but image creating them from scratch! 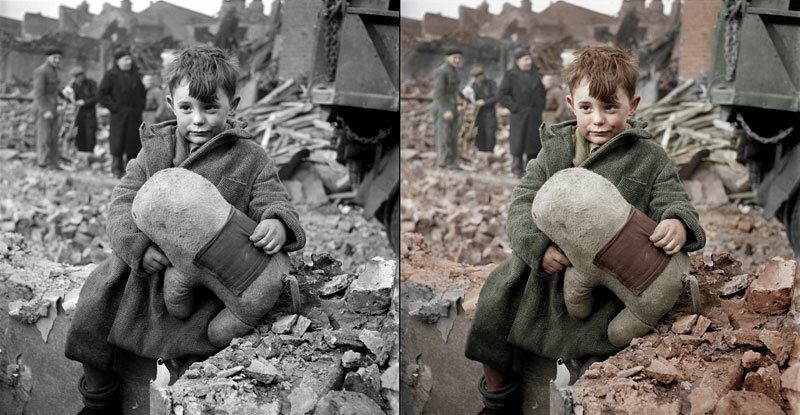 Check out this amazing collection of colour perfection where a series of old-school black and white photographs have been completely transformed. Isn't it amazing what colour does to an image? I mean, some of these shots look like they were taken just yesterday. Do our minds instantly associate black and white with historic/vintage/yesteryear? These days the craze seems to be manipulating clean, crisp images to look older, aged and vintage...but here's the opposite, and I'm loving it :) I'm excited to give it crack myself! It's also interesting to note that the artists who have coloured these images, have chosen a specific pallet. Why? Basic colour theory will explain that, but isn't it funny how that "teal & orange" look never seems to die ;) Take a look at the images below to see what I mean! Here's a slightly different example, this time green instead of blue, but still, it's such a good example of colour contrast and effective pallet choice. Again, two major complimentary colours. Posted on August 18, 2013 by Matthew Scott.